As the mid-19th century hymn has it, Good King Wenceslaus first went out, on the feast of Stephen, when the snow lay ’round about, deep and crisp and even…Note that it did not say ‘Boxing Day’, a name whose etymology is obscure, dating back apparently to 17th century Britain when work-boys would expect a ‘Christmas box’, a gift package, on the day after the great feast. Now, one may think, most people seem to attribute this day to all the boxes in which the made-in-China goods which find their way under so many Christmas trees are packaged and shipped and sold, you guessed it, in big-box stores. Rather, as we should reappropriate the custom, today is the feast of the first Christian martyr (leaving aside the unique deaths of John the Baptist, the last of the Old Testament prophets and first of the New, and of Christ Himself, Who are indeed ‘witnesses’ to the truth, if the Truth can witness to Himself). Stephen, whose Greek name means ‘crown’, was blessed with that noble title of giving his life in witness to the truth that Christ came to reveal, to fulfill, perfect and purify the Old Covenant, which in so many hearts, including those of his murderers, had become hardened, sklerotes, quite literally, dried up, calcified, withered. 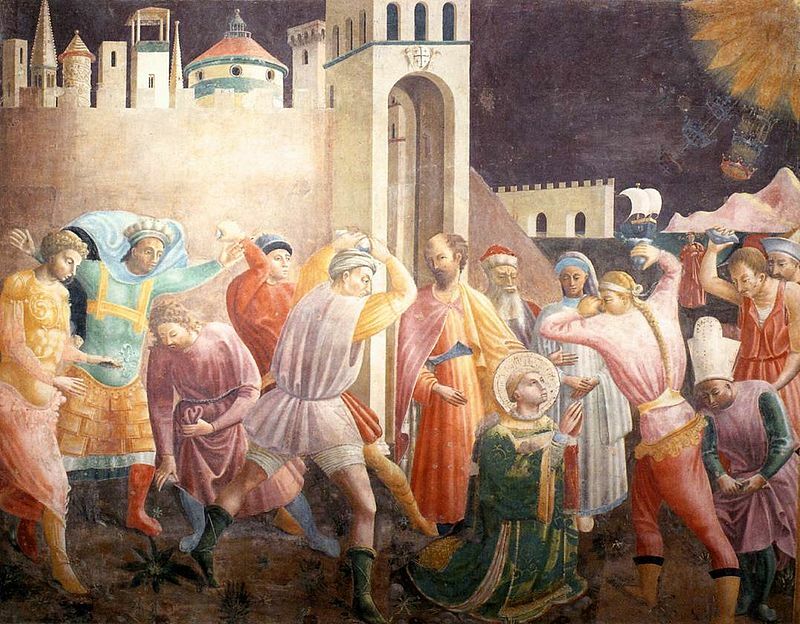 As he was being stoned to death, Stephen, also one of the first Deacons in the Church, prayed for his persecutors, that this sin be not held against them. And his prayers were efficacious, for one of the instigators was none other than a ‘young man named Saul’, whose hardened heart would soon be burst upon in that flash of light, and who would become ‘Paul’, the ‘little one’, but one of the greatest of Apostles. Nine centuries later, good king Wenceslaus stepped on out this feast on a cold winter’s day in Bohemia to feed the poor, to ensure that the least of his subjects had something for Christmas. Just as his page followed his king’s footsteps, to save himself from freezing, Wenceslaus himself would follow the well-trod path of his own king, martyred for the faith by his own brother in 935. The age of martyrs continues, as it will until the end of time, when Christ returns not as a child in swaddling clothes, but in all of His divine glory, to reward those who have been faithful to His truth. So rejoice in these twelve days of Christmas, looking past the boxes, the wrapping, the presents, to what they really represent: The fruitful and live-giving charity of God, and the good news that He sent his Son to bring. We as Christians should rejoice in laughter and good red wine, but also if these fine things are taken from us, and, in the world’s eyes, we have nothing at all, even our very lives. For eternity is everything, which is likely why we celebrate a young martyr on this first day of Christmas. On that note, may you all have a very merry one, on this feast of Stephen.